Obituary for Joan Dannenberg | Langeland Family Funeral Homes, Inc.
Joan Elaine (Wilcox) Dannenberg, age 86, passed away March 15, 2018 in Kalamazoo. 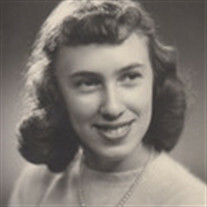 Joan was born June 21, 1931 in Kalamazoo, the daughter of the Paul and Mildred (Wunderlin) Wilcox. She was a lifelong Kalamazoo resident and was a graduate of Central High School and attended Western Michigan University. Working was an important part of Joan's life. Joan was employed for 40 years with Eaton Corporation (Fuller Manufacturing) and had also worked for 20 years with the State Theatre. She enjoyed golfing and bowling. Joan was preceded in death by her parents and her former husband Jerald Dannenberg. Surviving are many special friends including special caregivers John and Shirley Breedveld. Visitation for Joan will begin at 12:00 Noon on Monday, March 19th at Langeland Family Funeral Homes, Westside Chapel, 3926 South 9th Street. The funeral service will begin at 1:00 PM Monday at the Westside Chapel with Pastor Greg Carlson officiating. Interment will be in Riverside Cemetery. Memorials in Joan's memory may be directed to Hospice Care of Southwest Michigan.